In The Mauritius Command, the doctor is called on deck with a cry of "mermaid on the starboard bow". After looking his fill, the doctor comments to a shipmate, who replies "it was only a manatee (Trichechus, species various)". The doctor answers "A dugong (Halicore, species various) surely. The dentition is quite distinct from that of the manatee: the manatee, as I recall, has no incisors. Furthermore, the whole breadth of Africa separates their respective realms." From these drawings, we can see that more than the dentition distinguishes between dugongs and manatees. The head, tail, and flippers provide easy identification, as does size. Manatees are usually between 7 and 12 ft long, while dugongs average 5 to 9 ft. All sirenians are vegetarians; in fact they are the only group of sea mammals that are. 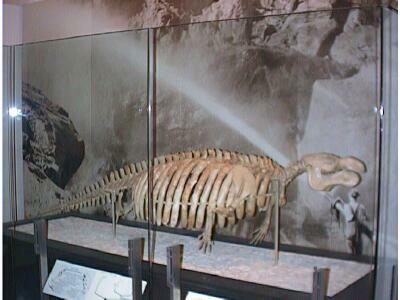 The fossil specimen is of a sirenian, the ancestor of both the manatee and dugongs. This is a great example of speciation, also known as vicariance, as predicted by Darwin. 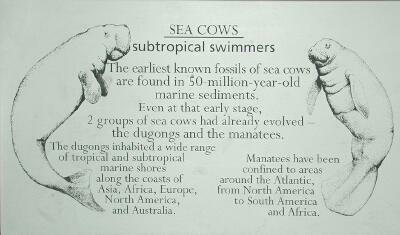 The ancestral form occupied the tropical waters worldwide. But as plate tectonics began moving South America northward, the populations in the Pacific and Indian Oceans became separated from the population in the Atlantic. When they could no longer interbreed, each group evolved into separate genera. The Doctor was able to see an even more unusual animal in Australia.